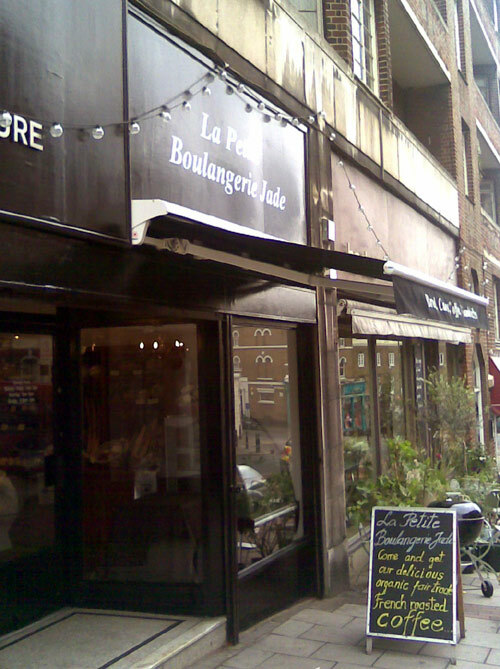 Following a recommendation from Michael P here, I thought I’d have a look at the new Petite Boulangerie Jade. It is next to Neals Yard Remedies, and is a smaller version of the bakery near to Hand Made Foods. Whilst the replacement of an over-priced clothes shop with an expensive coffee shop may not be the most suprising of changes to happen in Blackheath, it is quite a nice place, well decorated with black and white tiling. The only thing that annoys me is the excessive Frenchification of a shop that seems to be staffed by (very pleasant) Polish staff, and playing Polish pop music! 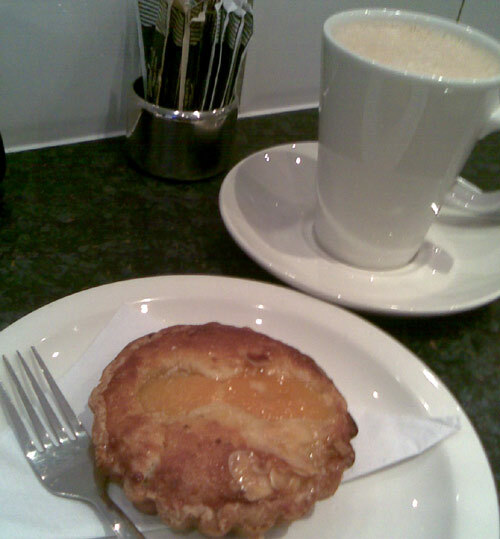 Anyway, £2.15 for a coffee and £2.30 for an almond thingy with a complicated name is about the going rate around here, and they tasted excellent. But the door makes a really loud beep every time it opens – what’s wrong with a little bell?! 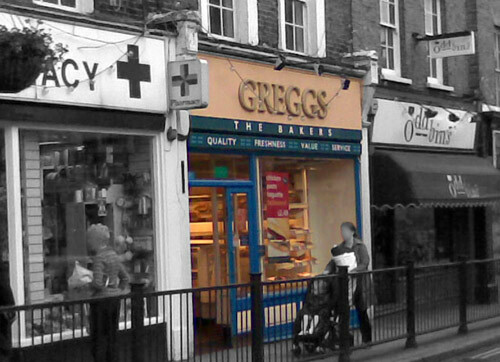 And then, just for comparison… Greggs… Oh my goodness. Greggs is a disgrace. But for some reason I find myself buying vegetable slices from there. I know they are crap. 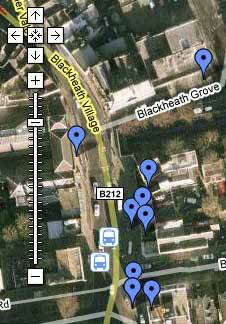 A friend of a friend once told me that they lived in a flat above a Greggs, and claimed it was infested with rats (not the one in Blackheath, you’ll be delighted to hear). Every time I go in there, I can feel myself slipping down into a world of misery. I really should try to give up.. Maybe if I cut down first, or go to the pharmacy next door, and ask for some monosodium-glutomate patches? Incidentally, the coffee is rubbish, and costs 90p. The vegetarian slices are horrible, but somehow addictive, and cost £1.05. 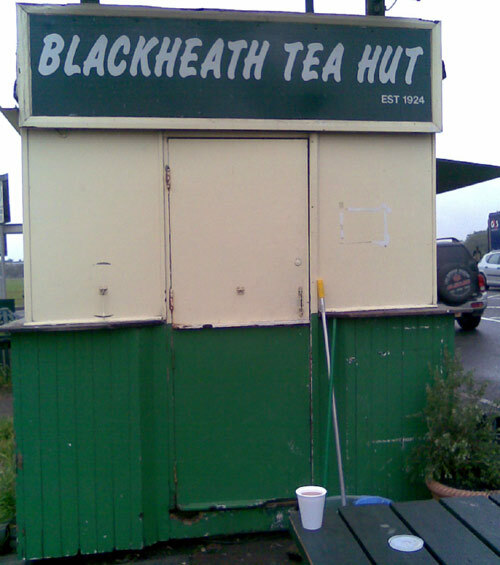 If you want a bargain coffee, head to the Blackheath Tea Hut instead – 60p (nescafe I think), plus they sell Mr Kipling Pies instead of frangipangy tartlets. I was looking for a copy of the movie about the Tea Hut, called “Tea Time“, as the idea intrigues me, and the website says that they sell DVDs of it in the hut, but I saw no sign of it. All the locations mentioned, can be seen on the Bugle Google Map.